In the last post, I did a surface level exploration of several cases of anti-war activism and policy in the 20th and 21st century, to show that while there are some great victories, not all peace inspired policy changes are unambiguously good. In this post, we’ll explore an area of high importance, and learning value for other future risks. One where I think there is a great deal of expertise, which the effective altruism movement has not tapped into: nuclear policy. The following video with Max Tegmark shows a set of views toward nuclear policy that seem to be fairly casually promoted within EA. Nuclear winter is probably the worst aspect of a nuclear exchange and could cause global starvation. The U.S. and Russia each have enough weapons to cause this outcome on their own. Accident is the most likely way for a nuclear exchange between superpowers to occur. There have been many close calls, so it is only a matter of time before an exchange happens by accident. Only a small number of nuclear weapons are needed to deter nuclear war, and additional weapons only increase risk without adding more deterrence value. Moneyed interests and politicians are the primary reason for current and planned arsenal sizes, and stigmatizing nuclear weapons companies via divestment is a good strategy for reducing arms and increasing safety. We should care a lot about nuclear weapons because they are a very large risk. Among the risks of nuclear war, the risk of nuclear winter is probably the worst. Accident is currently the most likely way for a nuclear exchange between superpowers to occur. It would be nice if there were fewer nuclear weapons across the board. It’s just unclear what the optimal reduction would be, countries should avoid giving away superpower status (they won’t if they can help it) and creating opportunities for Thucydides traps or incentives for other nuclear powers, less constrained by democracy, to race ahead and attempt to gain relative power at lower cost than they can currently. The fact that U.S. and Russia have about 7,000 nuclear weapons each does not mean that nearly that many warheads would be used in a nuclear exchange, most warheads are not on missiles or ready to be put in bombers, so 7,000 is not the most relevant number to bring up when speaking about the risk of nuclear winter. The U.S. has about 1,411 weapons deployed and Russia has about 1,765 deployed. According to the Department of Defense, far fewer than these numbers would be capable of launch within a day. If there were to be an exchange with one country (perhaps a smaller country), that doesn’t destroy either country completely, both the U.S. and Russia would probably want to be able to reset high deterrence levels as quickly as possible: warheads can be stored in much more secure ways if they do not need rapid access to the surface for launch. According to the Department of Energy, since the U.S. can’t currently make or test new nuclear weapons (there is a test ban treaty), maintaining a stockpile of multiple designs is useful in case a deployed design is defective and needs replacement. Back in 2009, more than 40% of employees deemed critical to maintaining U.S. nuclear weapons expertise were over 50 years old. Even the 1958 to 1962 weapon testing moratorium led to serious defects in the U.S. weapon stockpile. Non-proliferation and extended deterrence: if you have more weapons than needed for deterring nuclear war against your own country, you can prevent allies from developing nuclear weapons by deterring invasions or the use of tactical nuclear weapons against them. It is often undesirable for allies to build nuclear weapons since it increases the number of actors that could cause a nuclear war either on purpose or by accident. If new technologies change the optimal deterrence level to be higher, you want to be able to quickly deploy more warheads. During negotiations, countries might like to have excess nuclear weapons as bargaining chips. Though it is unclear that undeployed stockpiles have great value for bargaining as they don’t pose a risk when secured. The U.S. and Russia might not be that worried about nuclear winter anymore. Nuclear powers likely are more aware of winter risks than those who are not focused on strategic nuclear forces. As deterrence could be undermined to some degree if retaliation were to substantially increase the degree of self-harm, it makes sense that both Russia and the US would have an interest in understanding the odds of nuclear winter in different scenarios, and adjusting their strategies to mitigate winter effects by possibly limiting which targets they intend to strike (but perhaps this presumes too much rationality). It could be the case that nuclear winter is expected in the event of nuclear war, but that weapon levels low enough to avoid nuclear winter could be easily wiped out by a first strike attack. Alternatively, for what the U.S. and Russia plan to actually use in retaliation, nuclear winter could be hard to achieve. Nuclear winter requires target areas to readily firestorm and produce long-lasting, high opacity soot in the upper atmosphere which will remain there during what would otherwise be food growing seasons. Modern cities might not burn as firestorms as they are more resistant to fire than Nagasaki, which itself did not suffer a firestorm after a nuclear attack (though this may have been more a result of city geography). In addition to exterior concrete construction, many modern cities often have automatic fire suppression systems in their buildings. Though these would be overwhelmed in many cases, they would reduce the number of radiation initiated internal fires. Forested areas may also not burn as firestorms as large blast tests in heavily forested areas did not result in lasting fires. 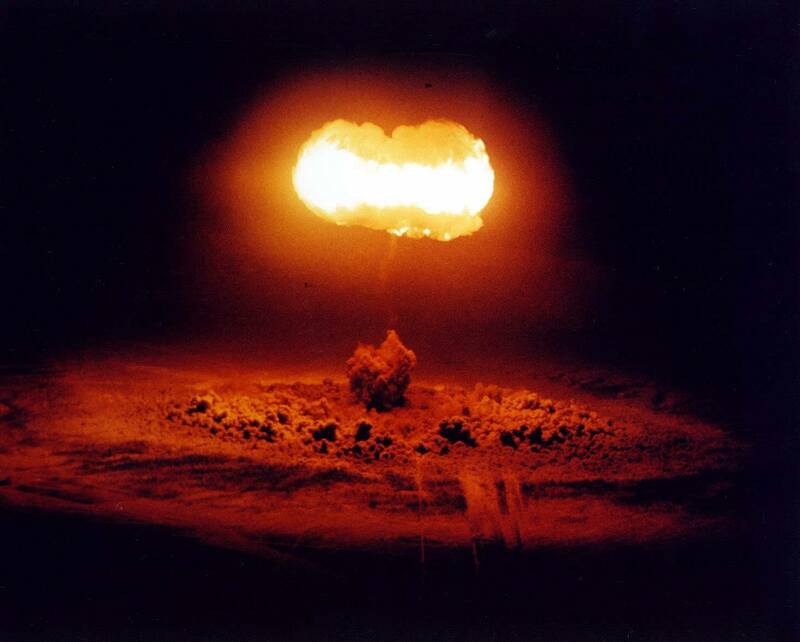 Though a larger nuclear blast might result in fires since heat radiation would dominate blast effects the larger the blast. (To visually illustrate this, you can see that the 3rd-degree burn radius increases faster than the blast radius as you increase the explosive power of weapons on Nukemap). Due to the stack effect, and inflow of air, such fires also may not spread beyond their point of initiation, limiting the quantity of forest that can burn to areas near nuclear silos. In the past, models were wrong about about hundreds of Kuwaiti oil well fires causing more than local cooling after burning uncontrolled for months, so the threshold for a significant winter event is probably not low. We aren’t even sure super-volcanoes were the cause of population bottlenecks for early humans. Though since smaller eruptions have been very disruptive via cooling effects, it is not unreasonable to believe nuclear winter could be a catastrophic risk. One recent model implies that over 2 billion could die from nuclear winter in a regional nuclear war, with global average temperatures 1.25 Celsius lower for years, and still -0.5 C below normal ten years later. As the victims would mostly be in the developing world, they might not deeply factor into the strategic calculus of some nuclear countries provided the countries achieve a winter safe food supply for themselves. Open Philanthropy Project’s cause report on nuclear weapons policy expresses some skepticism with current models of starvation from nuclear winter since they don’t address adaptation and current food reserves. One commenter pointed out that given the risks, one way to insure against the damage of nuclear winter without upsetting strategic stability would be via focusing on food storage. Though useful, it may not address long-lasting winters for which the ability to quickly ramp up production of non-solar dependent food would be critical. This idea is fairly well covered in the book “Feeding Everyone No Matter What” by Dave Denkenberger. Some may counter though that such defensive actions cut against the logic of mutually assured destruction, and could make countries with advantages at food production more hawkish. When accidental nuclear war is more likely than deliberate use, deterrence is likely a contributing factor to that situation. It does not make sense to reduce deterrence levels unless the result is actually a net reduction of risk. Without access to classified information, it seems difficult to be generally sure a nuclear exchange is more likely to result from an accident than deliberate use. While an exchange is probably in no one’s self-interest now, as technology, geopolitics, and the climate change, stable equilibriums may be disrupted unless we intentionally develop technologies and policies to maintain stability. Due to posturing, one country or another could happen to be in a position to quickly gain a decisive strategic advantage, without there being public knowledge of such a situation. It is not always guaranteed that defense will have cheap ways to retaliate. As command and control technology gets more advanced, there are less significant false alarms and more resilience. Unless there have been massive cover-ups, the only times that nuclear weapons have been detonated at remotely close to full yield has been in deliberate use. If you look at FLI’s timeline of near misses, there aren’t really any recent mistakes that actually have a decent chance of resulting in nuclear war. The closest might have been the 1995 Norwegian Rocket Launch, but even if the Russians didn’t find out it was a Norwegian rocket, they still would have realized from their radar that there was only one and that it wasn’t heading for them. This isn’t to dismiss the importance of other mistakes, just to say that the danger level of more recently listed mistakes is much lower than other mistakes in the cold war. The ability of a small number of nuclear weapons to deter nuclear attack may just be a situational fact, caused by alliances and superpowers with more weapons. Nuclear weapons may also deter more than just nuclear war. The point of tactical nuclear weapons is to deter even non-nuclear war: without them, NATO presumably would have had to spend far more on conventional force protecting Europe in the Cold War. This, of course, is a risk, because the actual use of tactical nuclear weapons to halt a war could result in escalation to the use of strategic nuclear weapons. Though such a risk may also add further deterrence value against starting conventional wars between superpowers in the first place. We should avoid binary thinking when reasoning about nuclear weapons: adding additional weapons probably both increases deterrence value and increases state/accident risk, but it depends on how many weapons a country already has. A rogue state with one nuclear weapon in a known location invites an incapacitation strike probably more than one without such a weapon, but as it gains more weapons and the ability to hide or protect them it becomes able to deter intervention. In the case of North Korea, incapacitation was deterred via their ties with China and ability to greatly harm South Korea with artillery. Syria and Iran, on the other hand, were incapacitated by Israel in the past before they could get decisive leverage over Israel’s interests. The deterrence value per nuclear weapon shifts with time: various technologies make incapacitating strikes more or less possible, and the amounts countries spend on these technologies shift the optimal deterrence level. Though I doubt U.S. and Russian numbers of weapons are optimal, having nuclear weapons in reserve (provided they are secure) makes a lot of sense if you need to quickly add weapons to re-establish optimal deterrence levels. If either the U.S. or Russia only had 200 nuclear weapons, while the other maintained its current level, it could be tempting for the more powerful one to try to incapacitate the other in a time of serious crisis. With a small number of missiles, the risk from a small false alarm might increase, since a smaller number of weapons would be expected to be launched in a first strike. In the future, a country with a large advantage might actually be able to assure with high probability that they stop every opposing missile in a first strike if they find and sink their opponent’s submarines, use stealthy cruise or hypersonic missiles on opposing missile fields and air bases, and use missile defense to stop any missiles that get through (such missile defense need not be cost effective on a per warhead basis if very few warheads get launched). Countries like China, the U.K., France, and North Korea are not counterexamples to this claim, since a first strike against any would disadvantage the attacking superpower against the remaining superpower, possibly involving direct retaliation. There may yet be ways for U.S. and Russia to maintain peace with much lower numbers of weapons, but this may require assurance of long-run good diplomacy or technology that is not currently being used to assure deterrence. Effective diplomacy is very likely to be more cost-effective than relying on high deterrence levels, and to generally have positive cooperative side effects, but it can’t insure against all of the same situations that deterrence can. If a country uses its small number of nuclear weapons against one attacking country, it may be subsequently defenseless against other nuclear powers. Though this discourages countries from being aggressors themselves, it may incentivize countries to use deception to try to get others to fight each other in order to gain an advantage. This sort of situation can be seen in multi-faction conflicts (Syria, Pakistan vs. India vs. terror groups, etc.) or the “truel” in game theory. Basically, in a three-way conflict the first actor to attack damages one opponent and reduces their own resources doing so: the remaining, unharmed opponent gains a large advantage from this. If the first actor tries to take out both opponents, they divide their focus and may cause their opponents to temporarily unite. If all parties are roughly equal, you win by tricking or forcing your opponents into attacking each by whatever means are available. This is why some states like arming terror/rebel groups even when they aren’t that value aligned with the funding state: it allows a country to advance its own geopolitical interests while getting its enemies (terrorists and opposing state forces) to kill each other. The funding state only loses small arms instead of its own troops and more expensive equipment, while also maintaining plausible deniability (eg. Pakistan does not want to directly go to war with India, but if militias hurt India strategically more than Pakistan, and serve as a buffer zone, then they advance Pakistan’s strategic interests more overall even though they keep attacking Pakistan as well). Moneyed interests probably aren’t the key influences on demand for nuclear weapons-related programs given that the Pentagon’s proposed budget and the budget authorized by Congress are the same for weapon systems that support nuclear weapons (eg. the B-2, B-52, ballistic missile replacement, air-launched cruise missiles, squadron spending for nuclear forces among many others). The only exception I could find is a less than 1% budget cut for unjustified program growth for modifications to the Trident II missile, though there may be another possible exception with the Department of Energy Nuclear Budget. This overall argument might be untrue if it is the case that the military figures out exactly what Congress is willing to pay, and then asks for that. I think this is the strongest argument against this point. This probably happens to some degree, but it is still the case that when Congress decides to throw extra money at something, it usually is not the nuclear budget, and furthermore, it would be the military arguing for the spending to be specifically on nuclear weapons, not politicians and lobbyists. The influence of lobbyists and politicians seems more along the lines of spreading program expenses over more congressional districts, than determining IF a program is going to exist or not. People may talk about Congress buying tanks the military doesn’t want, but in the grand scheme of things in a multi-hundred billion dollar defense budget, building more armored vehicles is a “cheap” way to keep some jobs around your state if you are a congressman. Roughly speaking, the military knows what it wants and Congress gives it much of what it wants. If the problem is defense contractors directly/discretely lobbying the military, then the people to engage with would be the generals and others in the Pentagon who make/determine budget requests. If we think we have good arguments for why they are wrong about what spending levels should be on nuclear modernization, then we should discuss and debate with them. Think tank analysts and technical congressional staffers may have some influence in this process by developing technical expertise and being able to argue for different budget levels. A commenter pointed out that there may be some influence via the DOE Budget since they are directly in control of nuclear weapons spending. For 2016, the weapons budgets match, however, the budget is growing, and Congress may have approved more for 2017 than the administration/military requested. The 2018 request is a large increase, and also decreases spending on non-proliferation (which sounds undesirable to me, but I am unsure what the optimal spending level is). It could be an example of influence by the Heritage Foundation as they seem to also generally influence this administration’s budget. Nevertheless, the arguments made by Heritage still rest on U.S. warhead development capacity being weak and outdated. Another commenter essentially pointed out that if Congress authorizes zero funding, there would be no weapons spending: therefore moneyed interests/politicians have influence. This is true, but misses the point: the spending is authorized because there is a perceived need, not because politicians have been bought. It does seem plausible that the small cut in trident missile modification could have been via a congressional staffer trying to slowthe U.S. from developing the ability to perform a first strike (trident missiles have been being modified so that they are more accurate and detonate with precise timing so as to take out hardened targets such as missile silos). So given all this, what should we do? What would be a good way forward for reducing nuclear risks while not creating other worse risks? The most important starting point is probably to develop understanding of the relevant considerations. Many of these basically sound mostly like great options, but hard to pursue, so in the remainder of this post I will focus on a subset of the problem: the difficulty of safe arms reduction. To reduce nuclear arsenals, some suggest we “start at home” and that a drastic decrease in U.S. expenditure may cause a reciprocal response from the rest of the world. I worry this is a little naive. When the U.S. finally started decreasing its nuclear arsenal in the 1960’s this didn’t generate a reciprocal response from the Soviet Union. Then again in the mid-70s, the U.S. began reducing its arsenal again (though after a build up, perhaps to increase its negotiating position) and the USSR kept building up until Mikhail Gorbachev became the General Secretary of the USSR and tensions with the West were eased. If we want activism to be effective, perhaps the relevant consideration is how democratic and susceptible to pressure are all the parties with nuclear weapons. If only some parties cave into the pressure, then the parties that do not just keep gaining advantage in world affairs. Are there any ways that the U.S. could give up weapons without increasing the strategic advantage of other countries? During the next round of nuclear modernization, what can be cut? What sacrifices will generals actually find completely acceptable given how advanced Russia’s current ability is and how China may grow? Its best to start by taking inventory of what there is, and arguments for and against each part as well as potential future parts. The nuclear triad consists of nuclear-armed submarines, bombers, and intercontinental ballistic missiles. The purpose of having a nuclear triad is to ensure that if one part fails, there will be others that can ensure deterrence, making war against a superpower an illogical move. The U.S. is currently deciding how it will modernize its triad, and some consider this to be a good opportunity for reductions in nuclear arms. Estimates of U.S. nuclear modernization cost range from hundreds of billions to over a trillion dollars in the next 20-30 years, but given the planning fallacy, I won’t be placing any bets on specific levels. Submarines are hard to hit (stable deterrent). This may be countered by new technology such as new machine learning algorithms for cleaning out ocean noise to enhance detection, cheaper sonar buoys/sensors, and smaller hunter/drone boats or subs that quietly follow missile submarines. Many of these technologies likely could be deployed in secret, for example, the stealth black hawk helicopter was not known about until the Osama bin Laden raid, and aircraft should be much more obvious and hard to hide than submarines since they can be viewed when above ground. Submarines, if hit, do not necessarily cause war (destroying them is not deterred). Due to the risk of legitimate accidents, certain forms of covert destruction may be very hard to attribute. (eg. if a submarine is incapacitated by a mine or a civilian vessel). While it is a weird coincidence that the U.S. had four missile ships knocked out this year by accidents near South Asia, this is likely the consequence of past attempts by the U.S. Navy to save money on training. The deterrence problem for submarines might be countered by a policy of counter-attack upon on sub strike, however doing so is likely to increase brinkmanship and the risk posed by accidents. One can easily imagine North Korea shooting at U.S. subs given its history, likewise in the past, the U.S. dropped “signaling depth charges” on a Soviet submarine which were misinterpreted as an attack, and nearly escalated to the firing of a nuclear torpedo. Submarines in some cases may be capable of incapacitation strikes, due to their ability to get very close and fire missiles. This is countered by land-based ICBMs on hair-trigger alert since it takes a considerable amount of time for a missile to go from the coast to the center of a country such as the U.S. or Russia. China currently counters incapacitation risk by hiding its land-based missiles and warheads deep underground, but may switch to a launch on warning policy due to the accuracy of new U.S. weapons. Accurate submarine-based stealthy cruise or hypersonic missiles may counter launch on warning if future designs have long enough range, though they may also be worse at destroying underground targets. This potential reduction in response time may encourage the automation of more components of command and control and potentially increase accident risk. Countries may be incentivized to use much larger counter value weapons on submarines if missile defense becomes effective against their other forces (eg. the 100 megaton, long range, nuclear drone torpedo Russian is working on). New detection technologies may destabilize deterrence from submarines by making them very vulnerable to first strike. Airbases and aircraft carriers can be distributed over a large area, making it hard to hit them all (stable deterrent). A counter-argument to this is that runways/airbases are still potentially easy to hit choke points. Lower performance: Harriers jump jets have a very high attrition rate and are easy to shoot down in modern times. Low numbers: There are about 10-20 F35Bs, though the Marines do plan to purchase more than 300 eventually. Lower payloads and range: The wing area of such planes must be reduced to assist vertical take off. Though the F35B is stealthy and can probably survive well if not detected, the planes still need to be staged at not a base to avoid being taken out in first strike attack: it doesn’t matter if the plane has the ability to not be at a choke point if it is kept at a choke point. Another counter-argument is that new anti-aircraft technology may make planes easy to shoot down. Better radar and infrared sensors combined with new algorithms from advances in machine learning may be good at telling radar where to look and shoot at mere “specs” or where to look for a plane after its weapon bay doors open briefly. The B2 bomber is less vulnerable to this since engine exhaust is concealed from the ground. Presumably, the next generation bomber which is also being made by Northrup Grumman will have a similar feature. If nuclear anti-aircraft missiles are ever fielded again, the inability to know exactly where a stealth plane is might not be relevant if the uncertainty is smaller than the blast radius. Such a warhead may be designed to mitigate EMP effects and to go off at an altitude that keeps fallout very low. Stealth standoff cruise missiles (hard to see or hit) combined with stealth planes (hard to hit) may make the air defenses listed above infeasible and sustain deterrence with the new technologies. Aircraft are slow to deploy (low risk of accidental war). There is much more time to resolve a false alarm that indicates bombers are incoming than a false alarm indicating ICBM launch. New satellite and real-time image recognition technology may make first strikes hard to hide. Since bombers are above ground, they can be seen when many leave their bases, though this is not as obvious as a missile launch. Countries could also use closer range means of surveillance, such as hidden cameras and spies to monitor when aircraft travel. Aircraft are the most likely leg of the triad to crash and explode by accident. This could be countered by better engineering to reduce odds of high yield detonation, however, a lack of testing and production makes it hard to replace old warheads or make sure they are safe after their design life/ in chaotic, hard to predict, crash and fire conditions. Due to their slow speed, aircraft are the least useful for targeting military targets in a retaliatory strike. Pilots may be unwilling to attack cities after essentially losing a nuclear war, since at that point they would only be reinforcing deterrence logic that failed, and putting their own lives at immense risk. It is likely however that a great deal of training and selection goes into countering these incentives. Stealth planes with stealth cruise missiles distributed across many bases could potentially be capable of incapacitation strikes. As currently only the 20 B2 bombers could likely carry stand-off stealth cruise missiles (which the U.S. does not currently have) and remain stealthy over the course of a mission, they would not be able to carry enough to hit all Russian land-based missiles (about 814 launchers). With the new bomber program, other stealth aircraft, and the Long Range Stand-Off Missile, the situation could change and become destabilizing. While stealth planes can be seen at closer ranges with low-frequency radars, such radar is not good for accuracy/targeting, and smaller stealthy cruise missiles might go undetected: stealth bombers would fly to just before the point of detection before launching missiles. Bombers also can’t simultaneously strike multiple targets without missiles, if strikes are not close to simultaneous, launch on warning is likely to succeed. If the advantage of stealth continues being weakened over time, which it likely will be, stealth cruise missiles would keep bombers relevant to deterrence. Further, the way in which stealth continues to be weakened by new technology may lead to stealth cruise missiles being detectable, but not able to be easily shot down: the optimal deterrence situation (both sides can verify each other’s attacks and reliably retaliate). Land-based missiles are an unambiguous deterrent, as they cannot be attacked without provoking an attack. Due to their speed, land-based missiles may be able to destroy some military targets in retaliation and are hard to destroy in the first place. When launched, land-based missiles are obvious due to spies and early warning satellites, so they can’t be used to incapacitate, as they would provoke retaliation. This may not be the case when warning satellites are broken, but it is less likely in the future that such systems will go offline. Land-based missiles focus enemy warheads into unpopulated areas (fewer fires than cities, less nuclear winter, less civilian casualties) vs. air bases and naval ports that are closer to population centers. There is a very large cost to destroying land-based missiles since they are spread out over large areas and hardened. The difficulty of destroying silos causes a second layer of deterrent: ⅔ of Russia’s missiles would be needed to destroy US land-based ICBM’s and there is no way to do that without pre-mobilization, which the U.S. could detect via satellite, offering the U.S. chance to pre-stage, harden, and/or disperse other nuclear forces. A potential counterargument to this is that in the future Russia might mobilize anyway when trying to use brinkmanship to gain an advantage, and in such situations risk will be elevated as long as the weapons stay pre-mobilized. Land-based missiles work and are hard to counter even if technological developments destroy the advantage of stealth. Land-based missiles are the lowest cost nuclear system in the triad. Land-based missiles are resistant to cyber attack since they currently use older hard to hack technology. Land-based missiles are highly reliable based on testing and lack of wear and tear from deployment. They are unlikely to be “grounded” for safety/maintenance all at once, unlike submarines or aircraft. Land-based missiles have high potential accident risk from being kept on hair-trigger alert. A counter-argument to this is that there exists a lot of more technology and institutional knowledge for preventing accidents than before. Sensor technologies have matured. Cuts to nuclear modernization could lead to lack of funding for command and control which would increase accident risk and deterioration of existing systems, but these sorts of cuts seem unlikely to come first. This could also be countered by taking missiles off hair-trigger alert, provided that there remains a way to mitigate any advantages that could be derived from re-alerting missiles. Immobile missiles are an easy target for first strike (most if not all locations are probably known). Since missiles in silos are hardened targets, weapons which target them would be very low altitude bursting weapons, which would generate large amounts of fallout, if nuclear. If faster missiles keep being developed, then there will be even less time to deal with any potential false alarms. The pros above for immobile missiles mostly also apply to mobile land-based missiles, though mobile missiles are not always hardened. Mobility reduces the ease of missiles being targeted for first strike, which reduces the necessity for a launch on warning policy depending on circumstances. The difficulty of finding such missiles likely reduces the number of missiles needed for optimal deterrence. Truck mobile missiles are probably less expensive than silo-based missiles, since one does not have to build a silo complex. Mobile missiles are harder to harden and protect. If underground tunnels are used, building hardened launch points is probably more expensive than making new missiles at hardened launch points without paying for so many miles of tunnels… therefore there is an incentive to just make more missiles instead of having mobile underground missiles. Launch points are also likely to be targetable just as current silos are targetable, which removes much of the value of mobility. If there are more launch points than missiles, it is hard to have treaty verification that the number of weapons has actually been reduced. Mobile missiles are more vulnerable to terrorists who might try to steal a warhead. This vulnerability can be mitigated via security procedures/designs that would make it effectively impossible for such terrorists to create any weapon yield (I believe this is already the case for most countries with mobile missiles). Mobile missiles are not being considered by U.S. Air Force currently. New stealth technology could deter first strike if it works, as it helps assure retaliation. This, however, relies on stealth weapons not being hit on the ground/in port. More technologically advanced powers will have a competitive advantage in stealth, which may lead to less instability during proliferation of such technology as it may take a lot of time to copy. New missiles, submersibles, and drones which could approach a country with minimal chance of detection could make nuclear first strikes more possible. Stealth weapons could also increase the odds that false alarms are seen as attacks, as noise picked up by radar could be perceived as an attack. More advanced radars, infrared sensors, and other means of detection may solve this problem by sensor fusion and machine learning that is good at ignoring noise. It would be hard for mere noise to throw off multiple systems at once which seek different independent indicators (IR, radar, etc.). This however reduces the deterrence value of stealthy nuclear bombers and cruise missiles, as they could become much easier to shoot down (if radar is not destroyed) though doing so can still be very hard. This seems is very unlikely, very expensive, and to also have some large downside risks (potential totalitarian state). Missile defense is probably too expensive to stop superpowers, so it won’t undermine MAD, but it can stop rogue states from being able to accomplish a long-range attack since superpowers can afford to spend far more than small states. I once did a Fermi estimate based on the YAL-1 which indicated the need for a balloon/blimp the size of a football stadium to support such a laser near the border of North Korea if one has the goal of destroying a missile in the boost phase. Though recent developments in making electric-powered lasers lighter, and getting drones to fly higher may lead to a situation where high endurance anti-ballistic missile laser drones become cost effective especially if a power source such as the Lockheed Martin Compact Fusion Reactor comes online in the next 10 years. This is highly speculative, and it seems unlikely all these technologies will be figured out in the near future. If one country becomes a singleton via missile defense advantage, it could lock the world into a bad state of affairs going into the future, though as stated before it is unlikely to succeed at becoming singleton in the first place. If some countries spend more on missile defense, others have to spend more on nuclear weapons to restore the same level of deterrence. Alternatively, if treaties on warhead and missile limits stay constant and are not violated this could lead to a focus on making missiles faster and more maneuverable, which in turn could reduce the time available to resolve false alarms. It is also possible that U.S. missile defense ambitions undermined the opportunity for the U.S. and Soviet Union to get rid of nuclear weapons in the past, though it is hard to imagine that agreement would actually have been reached, especially with respect to other nuclear countries. It is more likely both sides wanted to appear willing to give up more weapons to signal non-hostility. Increase precision allows the use of smaller warheads which would result in less risk of nuclear winter due to smaller fire areas, less fallout, and less direct deaths from an exchange. Accuracy is the most useful for counterforce/first strikes and the ability to perform a counterforce strike can be destabilizing. The expected reduction in harm to civilians could make countries more willing to use such weapons in the first place (both accidentally and deliberately). Though very unlikely, a country could potentially disrupt the command and control of other nuclear powers electronically to halt their ability to launch. Presumably, this is mostly not possible by design, and the relevant designs are probably classified to maintain that state of affairs. Hacking command and control could be possible, which could lead to spreading false information or unauthorized launch. Such hacking however is probably close to impossible by design. If hypersonic and stealth missiles encourage further automation of command and control, it will be important to make sure any machine learning dependent systems are not vulnerable to adversarial examples. Overall, nuclear policy is complex, and new technologies can completely shift what is best to do: with optimal deterrence and extreme instability being near neighbors in some pairings of technologies. The purpose of this post is to show that good policy is contingent on the technological and strategic situation countries find themselves in, and that making blunt pushes for different policies are likely to be unimpactful on policy or harmful if impactful. Without radical improvements in governments and diplomacy around the world, stable and reciprocal arms reductions will probably need to be paired with new means of deterring anyone from building new nuclear capacity if a world without nuclear risk is desired. Without such an approach, arms reduction itself could create the instability that would lead to a nuclear war in the first place. There are people, probably smarter than us, who spend the better part of their lives on the strategy of this at places like the RAND Corporation, the DoD Office of Net Assessment, the Center for New American Security, and the Center for Strategic and International Studies. The last thing we want as a community is to discredit ourselves by talking about things where we have weak information and knowledge compared to the current policymakers when we do want policymakers and think tanks to listen to us about something we are likely to develop a rather advanced understanding of (AI policy). If we want to create stigma, and make recommendations, then we should do the research, and engage with those who know more about this subject than we do… if we don’t think the research is worth doing because AI is more important and the people in government and think tanks are doing a great job, then we shouldn’t be insulting them. In this documentary from the Nuclear Threat Initiative the idea of getting rid of nuclear weapons comes up in the context of being able to deter any nuclear program: If strong deterrence can be done without nuclear weapons or something worse, that would seem like a better state of affairs: world peace without continued catastrophic risk as root the cause. Though the documentary is more about preventing nuclear terrorism than global risk, it still has relevant points. If you want nuclear weapons to go away, you can’t be the first to give them up unless you trust others with extreme power over you. Controlling fuel sources and providing nuclear fuel that can be used only for power at low cost may be a decent strategy to bargain other countries into not pursuing uranium enrichment. Command and Control by Eric Schlosser is a great book about past nuclear accidents. You can see a PBS documentary covering a lot of similar information here. Basically, you learn that there are probably way more accidents than you thought, and that nuclear security and safety used to be far worse. Roughly half the book focuses on the story of the Damascus Incident, to give a more visceral sense of things that went wrong, however, this may have led the story to have a bias in favor of the perspective of enlisted troops over officers. Example: in a fire where a welder literally drowned in hydraulic fluid it is probably safe to assume that he accidentally cut into the hydraulic line. On current weapons and strategy, Binkov the sock puppet is often a great intro resource for becoming aware of what technologies exist, relevant papers, and strategic considerations, though each scenario described is more like a silly war game than real life. Obviously, this isn’t a very scholarly source, but it is pretty decent given how he summarizes different weapon system abilities and considerations in terms of physics. This First Strike documentary series from the late 70’s is a bit out of date, unrealistic, and filled with propaganda, but makes some decent points about deterring first strike. Low flying bombers might have been able to contribute to incapacitating strikes to some degree in the 80s. (though an aggressor unable to destroy submarines would not be successful) The relative power of different countries influences foreign policy significantly even when there is no war (this is very obvious, but seems neglected by those who argue for unilateral disarmament) I don’t necessarily agree with those interviewed that the U.S. should have spent more on defense during that time window, since committing a lower % of GDP to defense probably results in a better economic advantage over time for a country though there is short-term risk. The Project on Nuclear Issues at the Center for Strategic and International Studies has had several debates on nuclear modernization and threats recently where you could directly speak with experienced scholars and generals in the field of nuclear security. Compared to other debates, there don’t seem to be many attempts at cheap shots or rhetorical moves, so the discussion norms are rather good for constructive disagreement between sides. If you live near think tanks, it may be worth watching out for similar events. On a final note, though I don’t agree with everything on it, I highly recommend the Arms Control Wonk Podcast, since they are very good at attacking bad ideas, as well as explaining the strategic capabilities and negotiating advantages of different countries. Thanks for this very interesting and thoughtful post! Here are a some comments. > about the risk of nuclear winter. Agreed; that’s why the video says “thousands”, not “14,000”, and why we always link to the FAS breakdown of deployment status. > is actually a net reduction of risk. FLI hasn’t argued against nuclear deterrence, merely against having more nukes than required for deterrence. A larger arsenal than needed for deterrence can increase both the probability of accidental nuclear-war (because there are more things that can go wrong) and its impact. Please beware the common misconception that we have nukes only for deterrence: “Compellance” has always been part of our military doctrine, and a Pentagon study argued that about 300 would suffice for deterrence alone. i didn’t follow your argument here. Are you arguing that the Pentagon budget request is never influenced by lobbying? They way I see it, there are two important influences: national security and lobbying. i wouldn’t say that one always dominates the other, as there are clear examples of both. For example, the launch of the Manhattan Project clearly wasn’t driven by lobbying, while I’m sure you’ll admit that there have been numerous military boondoggles. It’s also worth noting that the line blurs when you consider whether “compellance” should count as more of a defensive need or more of a strategy for furthering economic interests abroad. things are moving in the wrong direction despite trying all this, and we need to do more. I don’t share your concern that we’re discrediting ourselves “by talking about things where we have weak information and knowledge”. We’ve worked closely with many experts who’ve dedicated their careers to nuclear strategy, for example former Secretary of Defense William J. Perry, and the fact that they disagree with some folks at RAND and DoD doesn’t make them uninformed. Thanks for the response, Max! My impression is that the 300 estimate Isn’t endorsed by the Pentagon (if this is what you are referring to: http://www.nytimes.com/2010/05/24/opinion/24schaub.html) and that the range for minimum deterrence may be as high as 1,000. I presume that if there were to be another big reduction push, the US would want to be negotiating again with Russia, rather than unilaterally de-escalating. The number of deployed warheads by the US has been decreasing (the US is below the New START ceiling and Russia), and given that we are pretty close to the minimum range, the numbers don’t sound completely crazy anymore. In engineering, safety factors of 2 are common, and engineering is a much less adversarial process (though you have to fight entropy, nature isn’t strategizing against you/keeping secrets about its abilities.) Though in areas where there is more optimization power/efficiency requirements, a safety factor of 2 is far too high, with something as important as deterrence, with increasing conventional capabilities, and the variability of leader’s interests, the US’s current levels of deployed weapons don’t seem completely outside of reason (though I am sure there is room for improvement). Lobbyists have influence, but they are not always the decisive influence. The more informed a decision maker is about a given subject, the less marginal difference an additional lobbyist or researcher is likely to make. As nuclear policy has a lot of attention from the military itself (and a lot of the military does not like nuclear weapons), lobbyists are unlikely to make a large impact via information unless they present convincing analysis that the military did not do on its own. If a lobbyist represents a critical interest group that is beneficial to a decision maker remaining in power, then a lobbyist might have influence without providing much new information, but this doesn’t always influence internal military decision making so much (generals/military analysts etc. don’t have to appease voters or contractors, lobbyists are more likely to impact them via decision-relevant information). Therefore, since we only see tiny adjustments in nuclear budgets beyond what the DoD/DOE request, while we do sometimes see larger variation from Congress in other non-nuclear related military budgets, it is the non-nuclear related budgets that are more influenced by lobbyists/politicians, while nuclear policy is probably more decisively influenced by national security concerns and some degree of institutional inertia. I agree the military can screw up plenty, but it isn’t always due to the policymakers or lobbyists. On the Manhattan Project, I might actually argue opposite from you: had the Einstein–Szilárd letter not been sent to FDR, the US may have begun its nuclear program later than it did. Lobbying is most likely to have an informational impact when presenting new ideas, and reducing warheads/minimum deterrence aren’t new ideas. This is, however, why I agree AI policy may be a more promising area for risk-reducing influence. I like William Perry, agree with some of his arguments, and took one of his courses, but I haven’t really seen arguments from him that address the many of the points I made in this post. William Perry is well informed, but if I don’t see counter-arguments, I’m not just going to agree with him due to his authority and experience. I do think though that you are right that statements won’t be that discrediting if they don’t go beyond what people like Perry are arguing for. I’m not entirely sure things are going the wrong way, numbers are going down and in Mattis’ presentation of the National Defense Strategy, he was pretty explicit about deterrence being the goal. If modernization is done well, command and control will be improved, accidents will be less likely, and potentially destabilizing deployments will be countered. If done poorly, the modernization would be destabilizing itself and a huge waste of money. It’s hard to tell which it is going to be, since it depends on what other countries do and the ability of the US to negotiate reductions.